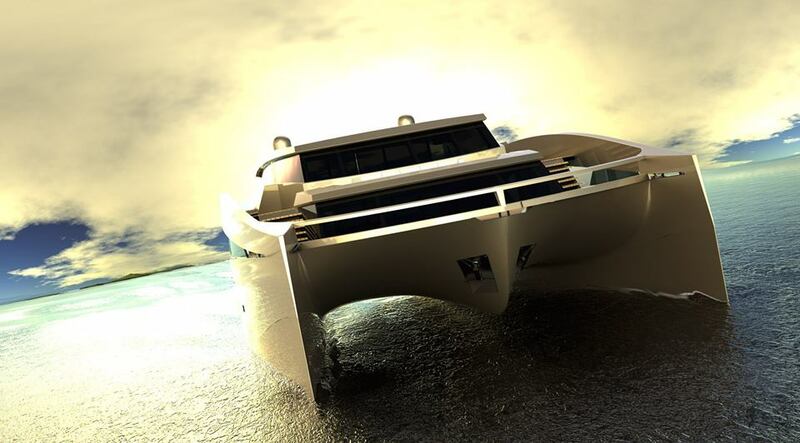 New 115ft catamaran superyacht 115 Sunreef Power concept – Superyachts News, Luxury Yachts, Charter & Yachts for Sale. The first (exemplary proposal) layout of the luxury yacht 115 Sunreef Power created by the Sunreef’s Designers consists of an impressive 80 m2 saloon situated on the main deck next to the spacious cockpit. The same level includes a kitchen with a pantry, an office, a gym, and located in the bow section, a 50 square meter master cabin with a separate dressing room and a luxurious bathroom. The windows offer an amazing panoramic view of the surroundings as well as the huge breathtaking 60-meter terrace set at the front of the boat. Foldable side balconies are an option on the main deck. The hulls are accessible from the saloon through separate stairs. To ensure maximum comfort, all of the 5 cabins have private entrances, en-suite bathrooms and lots of storage space. The navigation station is proposed to be on the flybridge where another 70-meter saloon and a comfortable lounging area are located. The increased garage space on the lower deck can accommodate a motor dinghy for 12 people, 2 jet skis, a diving set and 4 sea bobs. The 115 Sunreef Power superyacht is a true floating villa with all amenities, which will be designed by the Sunreef’s architectural Team according to the needs of the Owner. The latest offer of the shipyard delights with its form, sophisticated style and an intelligently layed out usable area. The exemplary interior arrangement includes shades of brown, beige and gray complemented by noble animal motifs. The concept stands out due to its lightness, as well as its innovative compositions of light. This superyacht is a combination of passion for sailing, elegance and high performance. Super yacht 115 Sunreef Power may be equipped with the standard drive, VOLVO IPS system or Water Jet. The boat will remain indifferent to anyone who loves to celebrate life and always wants to be a step ahead of others.